Bino's back was killing him. He was suffering from scoliosis. He couldn't move his legs - two of them anyway - and his tail just wouldn't swish. 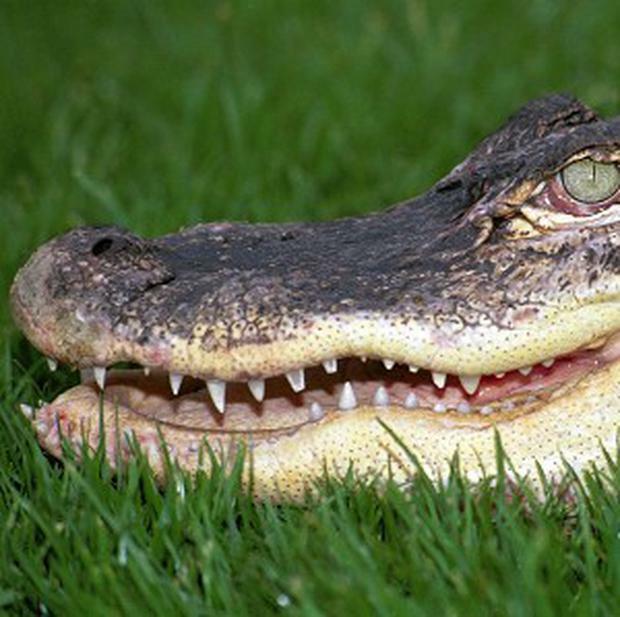 So what's an ailing albino alligator to do? Acupuncture, naturally. Bino, eight, has lived at Brazil's Sao Paulo Aquarium since 2007. Vets said he was born with his ailments and nothing seemed to alleviate them. So in early 2011 they decided to see if acupuncture might help, as it has other animals at the aquarium. "The acupuncture will ... alleviate his pain and keep all his vital functions going," said Rafael Gutierrez, a biologist at the aquarium, adding that the 30-minute weekly treatments would continue indefinitely, as long as they kept showing solid results. Acupuncture on animals is becoming increasingly common around the world, the aquarium biologists say, especially with pets such as cats, dogs and horses. The use of acupuncture on animals began thousands of years ago in China. In the US, the number of vets who hold membership in the American Academy of Veterinary Acupuncture has jumped 50% in the last few years to 900 doctors, said Simon Flynn, executive director of the academy based in Glastonbury, Connecticut. "There are many zoo veterinarians who use acupuncture, a number of equine practitioners who treat race horses with acupuncture, it's proven to be a useful treatment," Mr Flynn said. "It's common with dogs and it's becoming increasingly common with cats. More veterinarians are seeing the worth of the treatment." Typical ailments treated by acupuncture include neck and back issues, skin problems and pain in general, among other complaints. But Bino requires a few precautions not needed with your average house cat. Inserting the needles into his back requires the important first step of taping shut his lock-tight jaws full of razor-sharp teeth. Bino wrestles around a bit as the tape is applied, but soon calms down. Vet Daniela Cervaletti then slides behind Bino, firmly pressing the needles into his leathery white and yellow hide. The needles are inserted along his spine and around the area where the animal developed a hunchback. Bino does not move at all as nearly a dozen needles go in. Ms Cervaletti gently strokes the side of Bino's neck after she applies them all, then waits several minutes before removing them. Treatment complete, handlers help Bino back into a display pool, his white skin stark against brown fake rocks painted with foliage. He moves easily and swishes his tail, gliding along the water as a gaggle of schoolchildren squeal with delight, faces pressed up against the glass separating them from Bino.